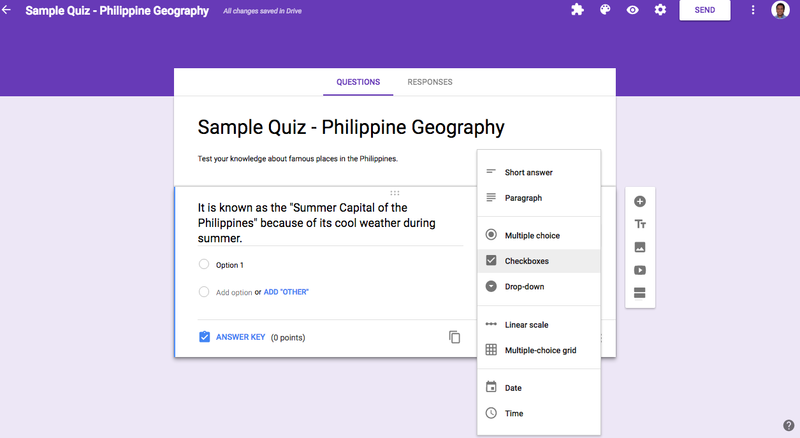 Easy to Use Quiz Feature of Google Forms | Edtech, Go! 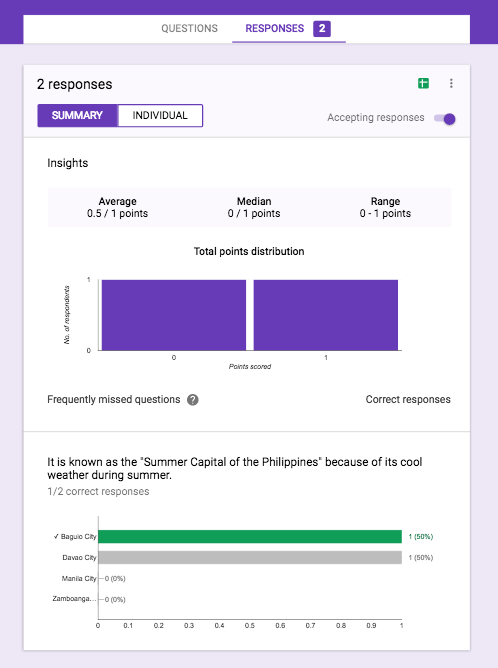 Google Forms has a new quiz feature that aims to help educators administer, well, quizzes or formative assessments to check for student’s understandings. The quiz feature is embedded in the app so there’s no need to install add-ons or extensions. 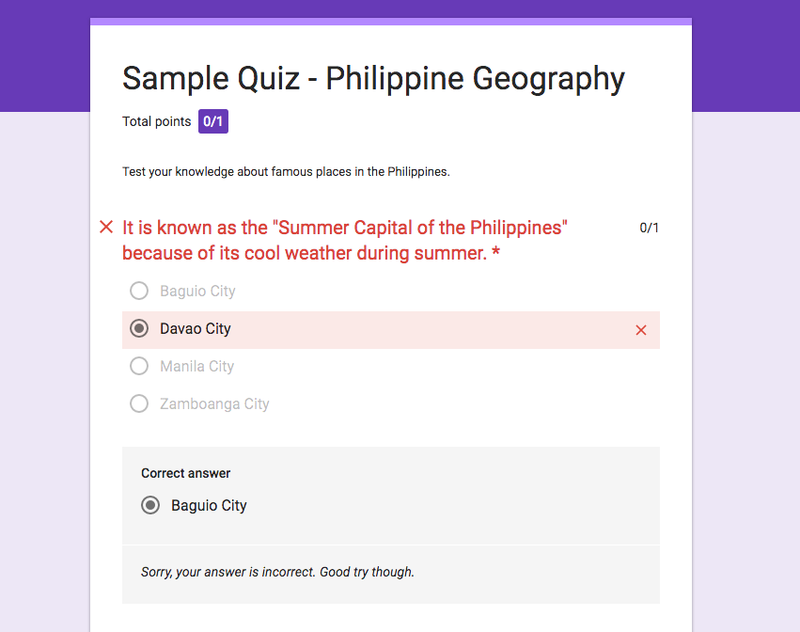 The quiz feature has been requested for so long. 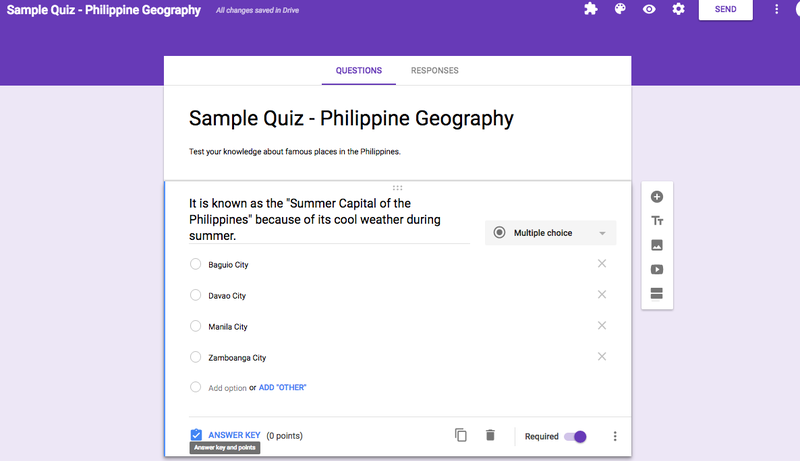 Now that it is part of Google Forms, take advantage of how easy it is to create a quiz with Google Forms. 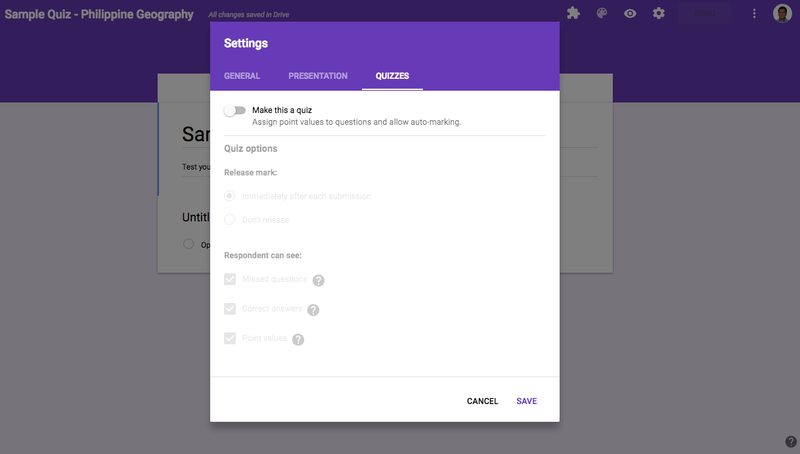 Furthermore, combining it with Google Classroom, all teachers can now facilitate checking for understanding in an efficient and quick way. Truly, there is less time “tech-ing” and more time for teaching. 1. 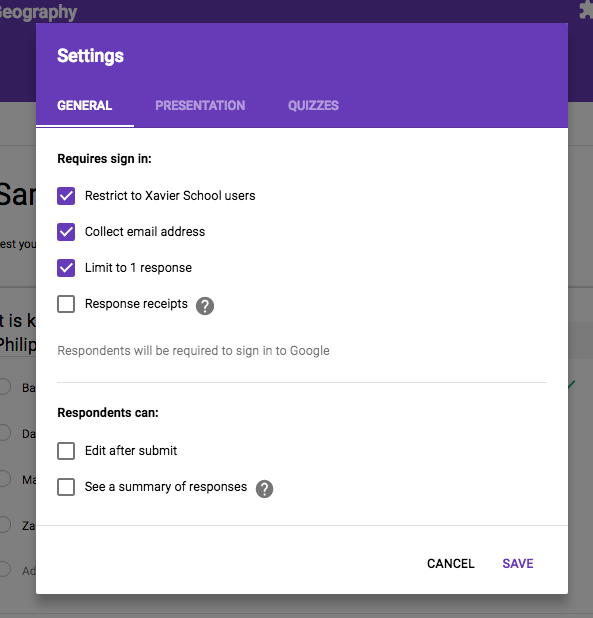 Start with creating a new Google Form document. Click “Settings” and in the “General” pane, options to restrict the quiz to domain users, to collect email addresses, and to limit to one (1) response are present. 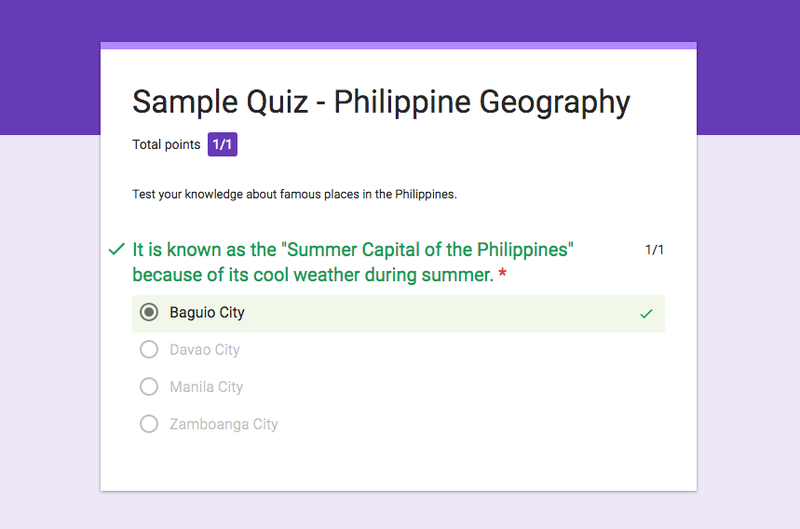 Then, look for and click on the “Quiz” pane. 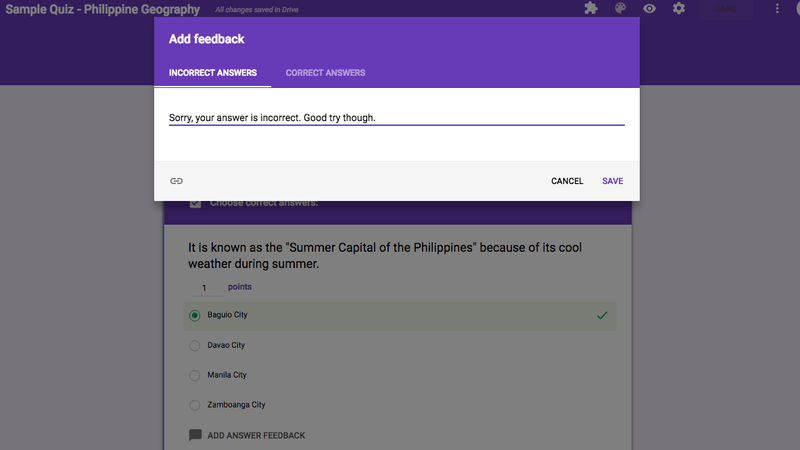 Enable “Make this a quiz.” Release remark immediately after submission to enable students to know their points or if their answers are correct or not. 2. Start creating your quiz questions. Choose the type of question to be created, e.g Multiple Choice, short answers etc. d. Complete the question or the stem of the statement. Provide choices from which the students can choose their answer. Click on “ANSWER KEY” to indicate the correct answer for the item. Choose the correct answer among the choices and it will be highlighted. 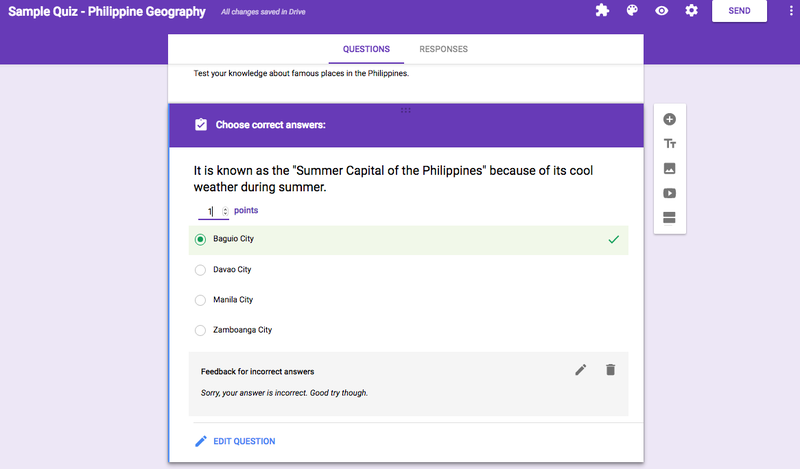 Feedback for incorrect answers can also be added to help students answer the question better. Indicate the number of points allotted for each item. 4. Return to the “Question” pane. A check mark indicates the correct answer. Notice that the beside “Answer Key” at the bottom is the number of points for the item. 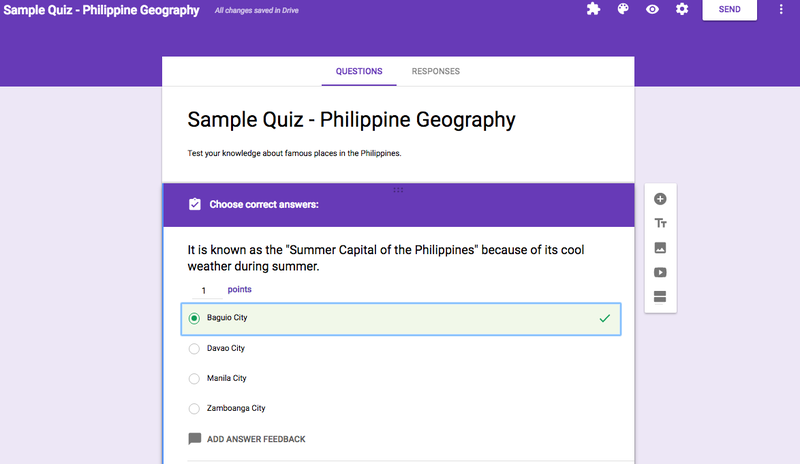 The quiz will look like your usual Google Form survey or document. 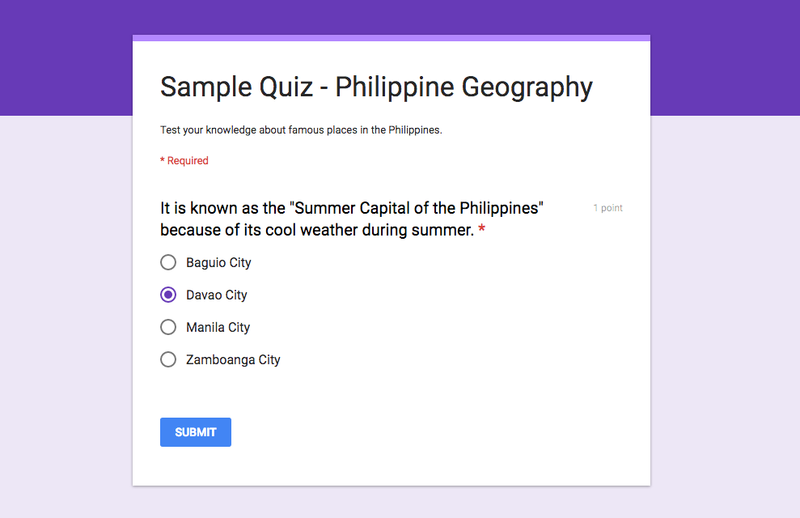 Share the quiz through the usual way of sharing a Google Form document. When students choose an incorrect answer, the screen will look like this. If the answer is correct, it will look like this. Teachers can also check a quick summary of the responses. Individual option to see some insights the performance of students for quiz can also be viewed. Average points, median points, and range of the points are also available. Individual item analysis can also be viewed, allowing the teacher to see how many of the students chose a certain option. 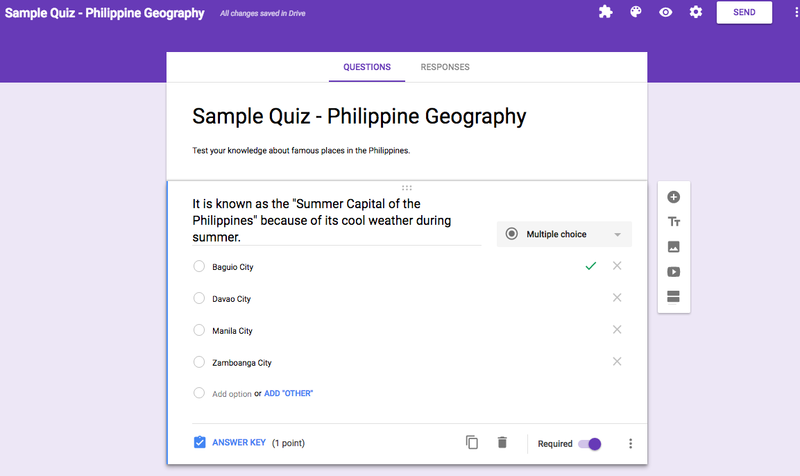 This entry was posted in 1:1 Learning, EdTech Tips, Google Apps for Education, Google Classroom and tagged formative assessments, GAFE, google apps for education, Google for Edu, Google Forms, quiz. Bookmark the permalink.